Do you remember those I-Spy books from the 1970s? Maybe they still make them, I’m not sure, but I had a small collection for the long car journeys to visit my gran in South Wales. For those of you who had a deprived childhood, they were pocket sized books based on a theme, cars, roadsigns, or agricultural machinery you are likely to encounter on the A303. If you spotted one of the things in the book, you could put a tick in the small box next to it until eventually, hopefully, you would have a complete book of stuff you had spotted. iPods and Game Boys were far in the future and my brother and I were happily engaged in this pointless spotting for years until we got Walkmans. It was always portrayed as a wholesome hobby, but to be honest, it’s just like organised trainspotting, which is socially unacceptable in most civilised countries. If there was an I-Spy book with orchestras as the theme, with separate pages for strings, woodwinds etc, then if you had this fictional tome in your hand and you happened to be at Heathrow Airport, Terminal 5 a few days ago, you would have had a bumper day. I knew something was up when I kept bumping into musicians I knew. Of course, this always happens unless you’ve gone to the wrong terminal. However, as I walked past yet another violinist, I had the sneaking suspicion that, although we do work together, he wasn’t in the LSO. When I started seeing other flute players it became clear that there was some kind of orchestra flash mob thing going down – and I hadn’t been invited. To cut to the chase, whilst the boys from Berlin were arriving downstairs for their appearance in the Proms, we were waiting at the gate next to the LPO who were off to Vienna (we’ll be there later this week). Across the way, the Philharmonia were boarding a plane to the Edinburgh Festival (we were there last week) and the CBSO were trying to get to Germany whilst coping with a baggage handlers strike and a sick conductor. That is sick in the traditional sense. With orchestral players well known sheep like tendency to follow the musician in front (although this doesn’t always work in a concert), it was amazing that we all managed to get on the correct plane, especially as we are all a little tired from the onslaught of touring so early in the season. Wiesbaden was our first port of call, a lovely spa town with a beautiful concert hall which only just manages to hold the LSO. We are travelling around what seems like the whole of Europe with the Peter Pan of conducting, Michael Tilson Thomas, who shall now be referred to for the duration as MTT. The first concert on a tour is always a bit of a blur as a lethal combination of tiredness and travel reaches its peak as the comforting warm embrace of the concert hall arrives. There was very little time to see much before we were up again at the crack of dawn to fly to Switzerland and then take the windy bus trip to Gstaad. When you finally reach the mountains it is a beautiful sight to behold and the air is clear and fresh which is just as well as I always feel sick from the bends in the road which always make me think we are going to reenact the end of the Italian Job – but without the gold. For what is an area flowing with money, for various reasons there is no hall in Gstaad, just a tent in which we play. Calling it a tent is probably conjuring images in your head which don’t do it justice, it’s not a normal tent, in fact, you could be forgiven for not realising that that is what it is. Until it rains. When it rains in the mountains, it really rains. There is one law in concert halls that applies to mobile phones and rain in tented halls. That law states that the mobile phone or rain shall not make its appearance until the very quietest moment of the piece. We were lucky enough to have both. In a performance of Mahler 1, the high A that starts the symphony was at times obliterated by the noise of water on the roof. There are moments in his symphonies that require off stage cowbells (we had those too, an occupational hazard in these parts), but here it sounded like Mahler had in fact been a Rolf Harris fan and employed him and his off stage wobble board soloist. I can’t help thinking that old Gustav would have enjoyed the effect and revised the score accordingly, for the rain I mean, not Rolf. 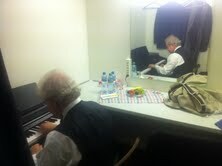 In the concerto the wonderful Emanuel Ax played piano. He is possibly the nicest soloist to work with, so humble, polite and musical. He should be required reading for soloists with diva like tendencies when they attend lectures at tantrum school. He warmed up on an electronic keyboard due to the lack of space and seemed to be enjoying himself immensely and once performing with the orchestra, he is so responsive that it becomes like chamber music. He was so engrossed with the performance, he didn’t notice the mobile phone that went off, naturally in the quietest of moments. I could see the lady in question in the front row as she realised that it was her phone. She ripped open her bag which unfortunately had a velcro fastening and sounded like a pair of trousers splitting, there was one more louder ring before she managed to stop the noise and then drop the phone on the floor with a loud thump. Quite a performance, but our soloist didn’t flinch. He is a joy to play with and have travelling with us. This entry was posted in European festivals September 2012, Gareth Davies and tagged airport, classical music, Edinburgh Festival, Gareth Davies, Gstaad, Italy, london symphony orchestra, LSO, Mahler, Proms, Switzerland, tour, travel. Bookmark the permalink. So – Gareth, when is the book coming out ???? Brilliant blog as always -vivid writing – we could almost be there, but thank goodness we weren’t! Better to read about it! Thank you again Gareth for this and other great blogs. The Gstaad scene rings a lot of bells (pun intended). When I lived in Switzerland in the sixties and seventies I was there every year to make innumerable paintings of great musicians. Yehudi became a good friend. Slava I painted in Geneva, Valery later, in Rotterdam. Just finished my own blog (www.normanperryman.blogspot.com) on a performance of my kinetic Piano Colours with Pierre-Laurent Aimard at the Helsinki Festival. Now off to the Bergen Philharmonic, Salzberg later. But I can’t compete with you guys. I couldn’t keep that up. But I love the atmosphere you paint so well. Norman Perryman. Thanks Norman, I enjoyed your last pun too! I remember very well a picture you did when Symphony Hall opened in Birmingham. My flat mate had it on his wall, Kurt Masur I think it was? It is a small world. I really wanted to come and see you in Aldburgh, but of course work got in the way. I really home we can meet up one day. Apologies – I didn’t mean to imply in my previous comment that I was sorry not to have been at the concerts and to have experienced the varied excitements- just that I wouldn’t have wanted to contribute to the travelling chaos or even to see LSO snug in cello cases! best blogger on the net but what I want is a top 10 list of Diva-like soloists. What do they demand? Kittens in their rooms? Their own nail stylists? confetti in the shape of Chopin? You are too sensitive, I knew what you meant!! Thanks! You obviously have inside info about the confetti. I can’t divulge such information though, I’d get the sack. Most of our soloists are lovely of course. Well, I was there. I love the Brahms no 1 concerto, & I missed Ax at the Prom last year; so, last minute, I came to Gstaadt. Thank you all. It was fantastic. EA gave the Brahms all his skill, warmth, and experience, and (this concerto is a real teamwork piece) the orchestra did too. It was a moving performance. And the LSO/MTT team infused the Mahler with a bit of magic. I was back on the train by Saturday afternoon, but made it to your rehearsal in the morning. I’m sorry I missed the Copland. It sounded exciting. Great pity about the phone; but I liked the rain. Really atmospheric! I hope the rest of the tour is as succesful.